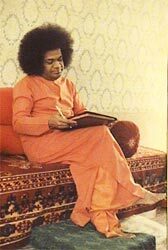 Bhagawan Sri Sathya Sai Baba is the Embodiment of Knowledge, Embodiment of Wisdom. Over the years through His Selfless Mission with a Peerless Vision, He has been tirelessly teaching humanity the right steps towards the Ultimate Goal of human life. Sri Sathya Sai Books and Publications Trust is the authorized body founded by Bhagawan to publish and thus spread the Divine Messages of Bhagawan in Books and Audiovisual forms. To know the Divine in Him, the right step is to draw ourselves near. And, enhancing our journey comes the the limitless ocean of SAI literature. Sai Literature is available in English, Hindi, Telugu and all other regional languages in the form of Books and Audiovisual products.